Getting excited about seeing Friday's Blue Moon? Well, we're sorry to be the bearers of bum news, but there are a few things you should know about this medium-rare occurrence. According to the accepted definition of "Blue Moon" -- that it's the second full moon in a month -- Friday's moon is indeed a "Blue" one. But the accepted definition is technically wrong. Each month typically has one full moon. But we base our days on the solar calendar, and the lunar calendar doesn't sync up with it exactly, so every two or three years, one month gets an extra full moon. 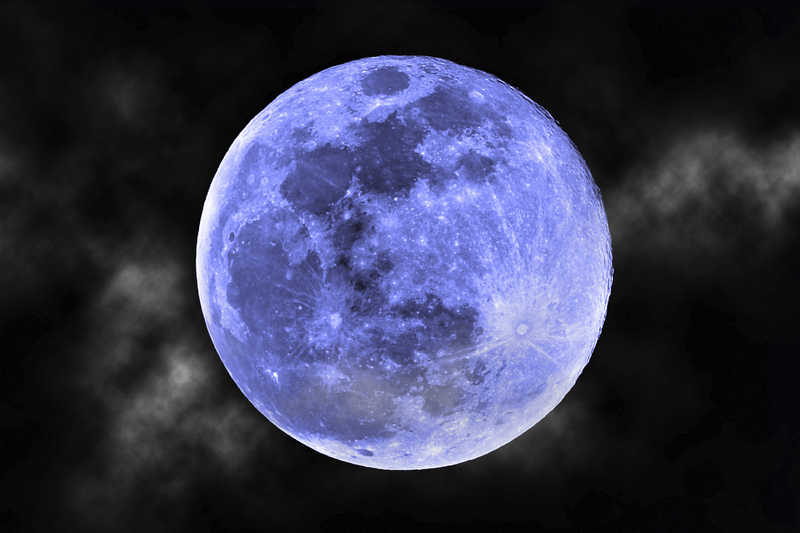 According to the Maine Farmers' Almanac from the first half of the 20th Century, which counted moons within three-month seasons, rather than per individual months, a Blue Moon is the third moon in a season that has four. In 1946, a Sky & Telescope writer skipped all the confusing details and wrote, according to the Library of Congress, "This second (full moon) in a month, so I interpret it, was called Blue Moon," thus giving us the erroneous definition we have today. So, really, the Blue Moon this year won't come until August, and will be the only full moon that month. It's not known how Blue Moons got their colorful designation to begin with. The etymology is murky at best, but it's pretty clear that it has nothing to do with the actual hue of the moon. This one's going to look like pretty much any other one. If it's any consolation, the moon can look blue sometimes, when particles of ash and smoke from a volcanic eruption or a massive forest fire scatter the light reflecting off the moon, making it appear blue. So you can hope for that to happen at some point -- or just be glad it hasn't. If you see the moon tonight it will look impressively round -- a full moon by any normal observer's estimation. But technically, it's already passed its max. The date of the full moon narrows down on what day you're going to see it. But since we and the moon are in constant rotation, there's an exact moment when the moon is officially at its peak fullness. Before and after that time, it looks perfectly plump, but is actually waxing or waning. Friday's exact full moon time on the West Coast was 3:43 a.m. It was 5:43 a.m. in Chicago, and 6:43 a.m. in New York. Australians were almost the only people on Earth lucky enough to get their un-Blue Moon during typical evening hours. An Obama administration national security official tells 60 Minutes, "Increasingly, you cannot tell which is which when it comes to the criminal and the intelligence agency."